The New England Clam Bake is a traditional method of cooking foods, especially seafood such as lobster, mussels, crabs, steamers, and quahogs. The seafood is often supplemented by sausages, potatoes, onions, carrots, corn on the cob, etc. 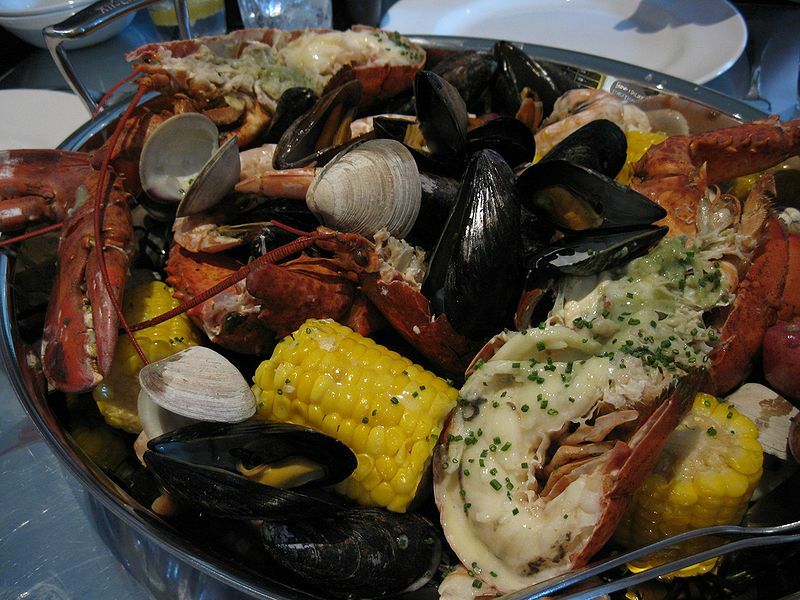 Left: New England clam bake - steamed lobsters, clams, mussels, corn, etc. Clam bakes are usually held on festive occasions along the coast of New England. A typical clam bake (or clambake) begins with gathering seaweed at the shoreline; seaweed is an important adjunct to cooking the food. To keep the seaweed fresh, it is necessary to have a container large enough to hold both the seaweed and a fair amount of sea water. Once the stones and seaweed have been collected, a fire pit is prepared. Some prefer to simply start a fire within the pit, while others line the edges with flat stones to provide support for a metal grill on which the stones may be placed. The stones used for cooking are then placed in the center of the pit and a wood fire is started, although the exact method of heating the stones varies. The fire must burn until the stones are glowing hot. Care must be taken to ensure that the fire will burn out shortly after this optimal cooking temperature is achieved. The ashes are then swept off the stones and raked between them to form an insulating "bed". A layer of wet seaweed is placed over the stones, followed by traditional regional foods such as steamer clams, mussels, quahogs, and lobsters. Side dishes usually include potatoes, corn on the cob, linguiça sausages, carrots, and onions. Alternating layers of seaweed and food are piled on top and the entire mound is covered with canvas that has been drenched in sea water to seal in the heat and prevent the canvas from burning. (Some may prefer to use beer to soak the canvas, but it is unlikely to have any effect whatever on the cooked food.) The food is allowed to steam for several hours. Since many locales outlaw building fires on beaches, and in order to accommodate the dish in homes or backyards, this dish is often prepared in a large pot. This is known as a New England Clam Boil. There are some caterers that specialize in clam bakes on the beach.